Lodgings in an old mill in the center of the landing beaches near the sea (3km). 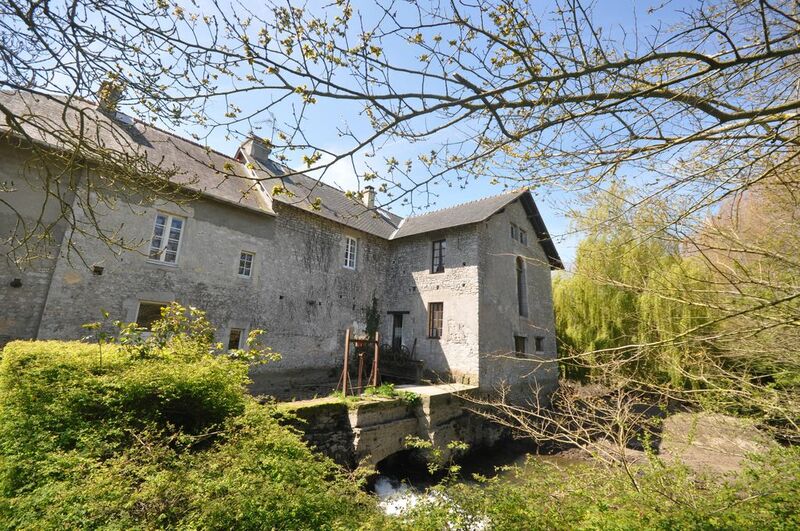 You will enjoy the quiet of the countryside and the charm of the river in a green environment. Two adjoining cottages available for 4-8 people, decoration sea or countryside. For a holiday with family or friends, you can rent two cottages together with connecting door 1 and with 4 bedrooms and 4 bathrooms and a surface of 200m2. Wed cottage decoration: max 8 people. It consists of a large living room with kitchenette, small living room with 1 sofa bed, bathroom, separate toilet, laundry on the ground floor. Upstairs 2 bedrooms with stunning views of the river and countryside. 1 room with 1 bed 2 people, 1 room with 1 bed for 2 people + 2 bunk beds. Bathroom and WC. Cottage decor CAMPAIGN: max 7 people. It consists of a dining room (1 sofa bed), a kitchenette, fireplace, bathroom and WC. Upstairs 2 bedrooms in a row followed by a bathroom and WC. 1 room with 1 bed 2 persons + 1 bed 1 pers, 1 room with 1 bed 2 pers. The linen is available to you free of charge for rentals of at least 1 week (sheets, towels, bath towels, kitchen towels, napkins). For short stays, you can rent towels: 30 € / cottage. Enjoy the charm of the river and a green field with trees and cherry 2.ha. No road within 200 m. Private roads, large yard where children can play safely and cycling. garden in front of the cottages with garden furniture and barbecue. South exposure. For history buffs, you will be the center of all the major sites of the Normandy landings, and between ARROMANCHES OMAHA BEACH, museums, cemeteries, American, German, English. Memorial of Caen. Annual events and celebrations take place around June 6. The city of Bayeux, a medieval town is 5km: Cathedral tapestry of Queen Matilda, the old Bayeux. Every year in early July the medieval festivals take place. For lovers of nature, you will find on-site hiking or biking, enjoy the river and discover geological phenomena. For sports, yachting, horse riding, paragliding, golf and other activities. Finally, one car you will be at Mt St Michel to Cherbourg (city of the sea) to Deauville or Honfleur, you will discover the Pays d'Auge, its half-timbered houses, cheeses and products apple. Total: Wed, countryside, quiet, relaxing, sightseeing, good restaurants and friendly! We look forward to welcoming you in Normandy. Do not hesitate to contact us for availability of each cottage or information. The cottages are closed December, January and February. We had a wonderful time here!! Our host even took us to a grocery store. We were so comfortable inside and out! Our family played table tennis, badminton and darts. We enjoyed picking and eating delicious cherries from the trees on the drive. The bathrooms seemed recently remodeled and were very nice. We enjoyed our time here more than anywhere in Europe. Would love to visit again! We are very happy that you have enjoyed our holiday cottage MER We are really moved that your stay with us is the one that you have most appreciated in your trip in Europe. Stay unfortunately too short and we would be happy to welcome the whole family again for a longer stay. Location was great! Very quite and plenty of space for 7 of us. The beds were very comfortable. The house was clean and decorated nicely. The kitchen was fully stocked with pans and pots, silverware, plates and bowls, cups and mugs. Apparently you have to pay for linens. When you are traveling you should not be required to pay for linens. Would have liked to have fans to plug in at night. The internet/wi-fi was terrible. The language barrier was difficult. Overall it was a very nice place and I would stay again. Merci d'avoir apprécié le calme, le confort, la propreté, la décoration et le bon équipement de notre gite MER. Nous ne sommes pas un hôtel mais un gite où nous proposons le linge de maison : les lits sont faits, vous bénéficiez de draps de bain et de serviettes de toilette, de linge pour la cuisine. Le linge de maison est payant pour un court séjour, mais si vous séjournez chez nous une semaine ou plus, il est à votre disposition gratuitement. Vous êtes nos premiers clients qui nous demandent des ventilateurs en Normandie !!! Le débit internet est certes parfois insuffisant à certaines heures mais cela est indépendant de notre volonté. Nous serons toujours ravis de vous accueillir à nouveau. Fabulous and comfortable - perfect location! We felt like we were hosted by friends when Martine and Jean-Louis greeted us on arrival. We stayed in Gite Mer for an all-too-brief 3 nights. Our family of four (2 11 year olds) loved the peaceful setting and spacious lodgings. After a long day of travel starting in Atlanta we were instantly relaxed and at ease here. All amenities were up to date and in perfect working order. It was like staying in our own home - if only our own home was so clean and had stone walls and an authentic mill with brook rushing past! The animals (dogs, cats, goats etc) wandering around were fantastic and the kids liked playing foosball and darts in the barn/garage. The location is perfect for a visit to Normandy whether your interests lie with the D-Day sites or the more ancient history evident in nearby Bayeux and elsewhere. We did a day trip to Mont St. Michel without trouble as well. We seek out self-catering accommodations whenever we travel and the Ribots offer a top-of-the class option with their Gites. I cannot fathom why anyone would want to pay far more to get far less at a hotel, especially in the pastoral setting of Normandy. Tout etait parfait! Merci Beacoup, Martine, pour votre hospitalite! Thank you for your appreciation. we are very happy that you keep very good memories of your stay in our cottage. We are indeed well located to visit all the sites of the Normandy landings while enjoying a quiet and green location. The cleanliness of our cottages is a priority for us and their equipment. You need to feel at home! We welcome you with great warmth all Americans will be staying with us, especially in 2014, one year full of memories. Idéalement situé pour découvrir en famille la Normandie et ses plages du Débarquement, le gite Mer est très agréable tout comme les propriétaires, très accueillants. Gite très confortable, parfaitement équipé, propre avec une décoration thématique soignée. Une vraie belle découverte sous le soleil normand. Séjour idéal que nous recommandons. Perfekter Haus für einen perfekten Urlaub! Wir (drei Erwachsene plus Hund) haben herrliche zwei Wochen im Gite Campagne bei Martine und Jean-Luis verbracht. Die herzliche Gastfreundschaft der beiden hat es uns leicht gemacht, uns von Anfang an wie daheim zu fühlen. Das Haus, gemütlich eingerichtet und mit viel Liebe zum Detail dekoriert, erwartete uns blitzblank geputzt. Die Küchenecke ist zwar klein, aber dennoch mit allem ausgestattet, was man braucht (es gab sogar eine Salatschleuder und einen Pürierstab!). Die Mühle liegt mitten im Grünen, nur drei km von Port-en-Bessin mit seinen vielfältigen Einkaufsmöglichkeiten, Café-Bars, Restaurant und dem Fischereihafen entfernt. Die Bilder zeigen genau das, was man bekommt. Wir haben schon mehrere Urlaube in der Normandie verbracht, waren aber das erste Mal bei Martine und Jean-Luis - nächstes Jahr kommen wir wieder und haben schon reserviert! Sicher ist sicher! Top site! Great hospitality combined with the perfect starting point for a normandy tour. This the third year now and we keep coming back. durée location 2 nuits minimum en basse saison : 320€ pour 2 nuits + 60€ jour supplémentaire + 20€ linge de lit + 40€ forfait ménage. N'hésitez pas à demander.